b. The Art Deco style first arrived in America after the Paris Exposition of 1925, where it was promoted as a fusion of the decorative arts and industry and technology. Art Deco was a relaxed precursor of the International style. The style features applied decoration based on organic forms and geometric patterns, executed in the latest construction materials and methods. Forms are angular, and facades often stepped back, especially in taller buildings. Decorative elements range from industrial to Egyptian, Mayan, and American Indian themes. Building forms and decoration generally have a vertical orientation. In South Florida, nautical and tropical motifs, such as palm trees, flamingos, pelicans, the moon, and the ocean, are reflected in bas-relief stucco panels, etched glass, and murals. 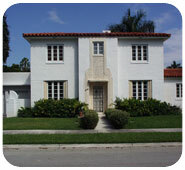 The related "Moderne" style evolved from Art Deco.